In 1959 Alfa Romeo designed a new car to set new standards in racing. Busso and Colombo developed a tubular frame to carry the Zagato Kamm-tail body. The car was fitted with the 1600cc DOHC engine. Alfa Romeo started production of the car in 1962 although the company had no production capacity for this project. For homologation a hundred cars had to be build. 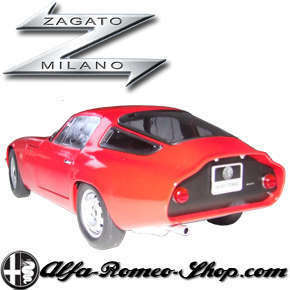 The construction of the tubular frames was outsourced to Stabilimento Aereonautico della Ambrosini and the bodies were built by Zagato in Milan. Carlo Chiti’s Autodelta in Udine assembled the cars. The Alfa Romeo TZ has an amazing racing history. It raced the Targa Florio, Le Mans 24 hours, Sebring, Nürburgring and many more. SKU: AA070196. Categories: Zagato, Giulia (105/115). 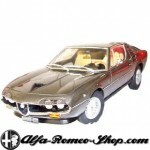 Tags: 1:18, Autoart, Giulia, TZ, Zagato. 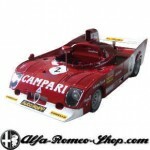 Autoart model of the Alfa Romeo TZ in scale 1:18.